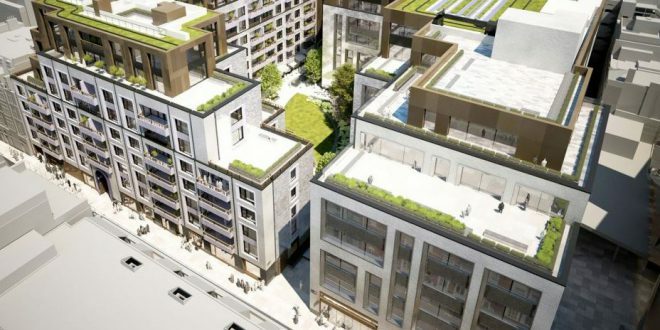 The £215 million Great Portland Estates (GPE) redevelopment of Rathbone Square in London’s lively West End required an innovative solution for predictability of delivery, all while maintaining the highest quality standards to deliver a building which would last for many decades. This mixed-use development, comprising office space, retail outlets, and 142 prestige residential apartments all located around a new garden square, was delivered as a result of foresight, collaboration, communication, and a desire to embrace digital technology across the supply chain. The project required experience, skill and knowledge of 3D modelling and its collaborative digital process to improve the design, construction and operation of the asset. GPE, under the direction of James Pellatt, was an early advocate of digital construction methods, having seen it used on other projects as a way to mitigate risk. GPE had worked with BIM. Technologies previously on the 240 Blackfriars project which was one of only a handful of BIM projects in London at the time. Using digital construction as the core project framework was very new, and was especially rare on such a large, high-profile project in one of the major capital cities in the world. The BIM process has been the consistent supporting thread within the teams, and it is this collaboration that made the project a success. During the project BIM. Technologies developed its Warboard issue management platform to monitor the coordination, which provided a dashboard for GPE and the design and construction teams – allowing clear visibility of progression and encouraging openness. As the project progressed, BIM. Technologies created a digital model of the apartments providing a virtual reality experience for the design and construction team. They used Oculus Rift headsets to walk through the plant room virtually which allowed any issues to be reviewed at close hand and to check all plant was accessible before the actual construction phase, removing the risk and any opportunity for re-work. What models are most popular on 3D markets?